TEL AVIV — Syrian state television on Sunday reported that “enemy” rocket attacks struck military bases in Hama province and in the Aleppo countryside, with reports of 26 or more pro-regime fighters, mostly Iranians, killed in the blasts. The monitor said the casualty count is expected to increase, with some 60 fighters still missing. 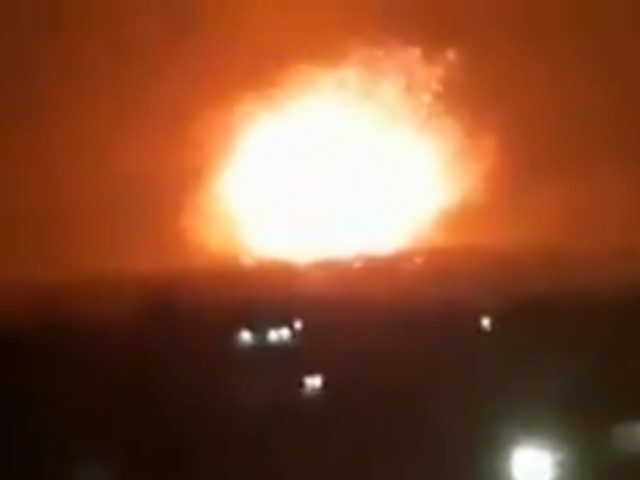 The target of the attack in Hama was an Iranian depot housing missiles, accounting for the huge explosions seen at the site, the monitor further reported. It was not immediately clear which country was behind the alleged strikes. The Syrian Observatory monitor speculated that Israel was behind the attack. The Israel Defense Forces has a policy of not commenting on operations beyond the West Bank and Gaza Strip. Notably, the attack took place hours after Israeli Prime Minister Benjamin Netanyahu talked on the phone with President Trump and the same day Netanyahu met in Jerusalem with U.S. Secretary of State Mike Pompeo. Netanyahu on Monday held an emergency meeting of his security cabinet in light of the developments in Syria. On April 9, strikes blamed on Israel hit the Iran-run T-4 military base that was reportedly used to operate Iran’s advanced drone fleet. The strikes came after the base was brazenly used by Iran to send an unmanned aerial vehicle (UAV) into Israeli territory in February before it was quickly shot down by the Israeli military. The IDF revealed its investigation concluded the Iranian drone sent from T-4 was carrying explosives and seemingly deployed to attack an Israeli target. On April 14, there were reports of a “violent explosion” in the southern section of Aleppo province in Syria in an area where Iranian forces were present. Hezbollah-affiliated media outlets at the time claimed the incident involved a controlled explosion.